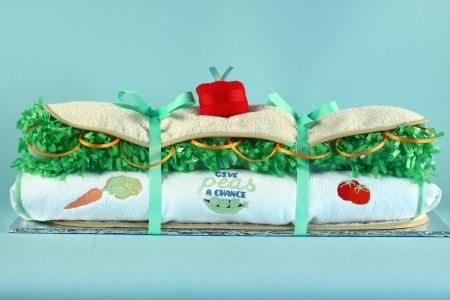 The Vegetarian Baby Hoagie�has all the same baby gift appeal as The Original Baby Hoagie�from Silly Phillie. It's clever & unique, visually exciting to make a big impression, and made with quality layette items for baby. 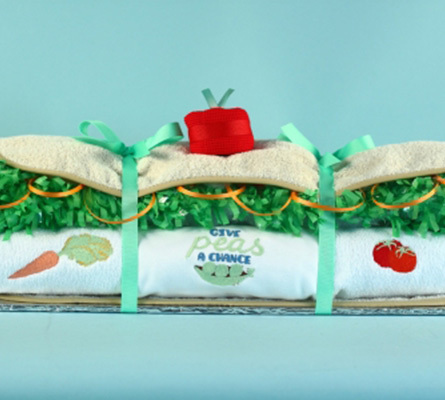 The difference is the healthier fruits & veggies theme highlighted by "Give Peas a Chance"! Made In America Layette 100% Cotton Interlock Onsie w/embroidery design Interlock Hat Terry Bib w/embroidery design 2-terry burp pads Baby blanket Terry washcloth w/embroidery design Each Vegetarian Hoagie Baby Gift�is "Made to Order". Yours will be tastefully assembled as shown in photo then wrapped in clear cello for maximum visual excitment. The gift meassures 24" x 8" x6" (H) and looks good enough to eat!